Model stitched on: 28 count antique white Jobelan® from Wichelt Imports, Inc.
Model size: 17" x 12.75"
Description: This sampler features a heavily-robed, white-bearded figure seated on a wooden throne amid the snow and evergreens. 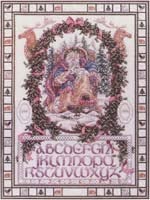 Surrounding the figure is a holly-covered oval border flanked by two reindeer in profile. A Celtic-style alphabet is contained by a white-work and bead border. The outermost border consists of alternating blocks of whitework, and several different animal motifs. Stitching Comments: In this design, there's an abundance of quarter stitches, (as usual) and an average amount of blended threads (about half of the symbols). Don't be intimidated by the white-work ...save it for last (except for the beads). That way, the white floss won't have a chance to get soiled, and the specialty stitches won't get snagged. Practice the white-work stitches on another piece of the same fabric until you are comfortable with them...then, Enjoy!